Now let’s meet the most obviously abusive part of the Drama Triangle, Persecutor. Persecutor tends to talk in a very compelling, powerful voice, and sometimes its message is so cloaked or only implied so that it’s hard to recognize that it is abusive. Whatever the message, Persecutor energy feels condescending, blaming, shaming, criticizing. And knowing that it exists, and a little about how it works, can help you identify it. One of the functions of Persecutor is to discharge the energy of unconscious anger, fear, powerlessness and frustration. The need to discharge this energy is real. But it can be done in healthy ways. When we notice Persecutor energy, it is our cue to take a step back and regroup. We can then ask Persecutor to shift and take the role of Challenger, who creates the safety and structure needed to make clear the logical steps necessary to reach our goals. Thus, the intense energy of Persecutor can shift to the powerful but non-violent masculine energy of Challenger, whose job it is to hold us accountable, but to do so wisely, with the focus on supporting our growth and learning. For people who find themselves stuck in an emotional flashback, what’s playing out in the world around them mirrors what’s going on inside their minds. (The same is also true for people who are in perfect peace, and completely in their power. But that is a subject for another book.) This is confusing, but it also can be helpful because when it’s projected onto someone else we can better see it, name it, and deal with it. With the right kind of help, it’s easier to figure out what is going on, sort it out, and turn it around when other people are playing these parts for us. In the table below, the first column is the voice of Persecutor. The second column is how Persecutor Energy is projected out into the environment. Notice how the column on the left could actually be the same as the one on the right. 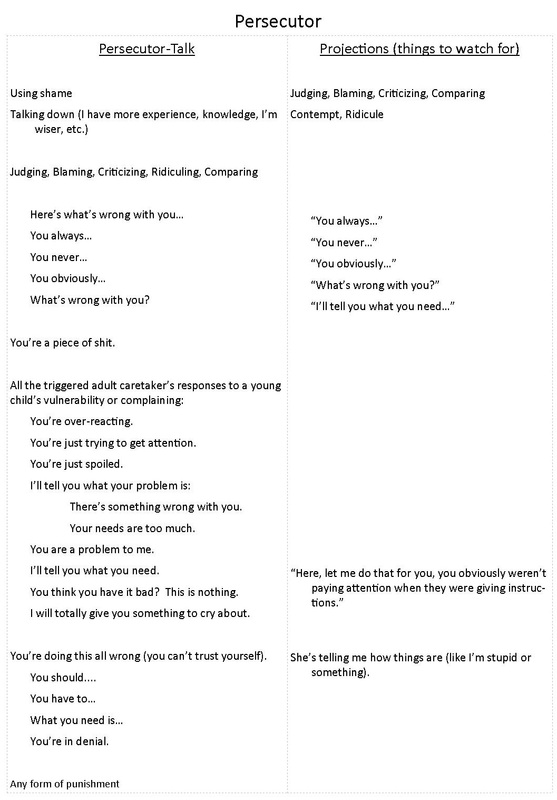 People who are triggered say the most outlandish, damaging things, so all of the things in the “Persecutor-Talk” column are also quite often heard in moments of tension, when people lash out, or speak before properly connecting with their deepest values or their self-respect. Contempt, judging, criticizing and blaming characterize Persecutor. This stance is just another defensive strategy that can become automatic when we witness contempt, judging, criticizing and blaming in our environment as children. We learn by watching our parents as they avoid their more tender feelings of fear, vulnerability, and sadness. Like Rescuer energy, Persecutor energy once offered us a viable solution to the problem of stress and discomfort, and our brains adapted by habituating those particular thoughts and behaviors. When we notice contempt, judging, criticizing and blaming in our internal environment, we can begin to recognize them as red flags, indicating the need to pause, regroup, and shift to Challenger. Persecutor energy can be redirected so that it is actually very helpful, supplying essential masculine guidance, leadership and structure, helping TVP take steps toward re-establishing safety, relieving pain and replacing abuse with clarity. Challenger helps us to see how we have actually learned and gained wisdom from our experiences, however intense or impoverished, to become the resourceful individuals we are today. In your most empowered moments, what have you learned that your parents didn’t teach you and your younger self never knew? What would it take to own and embody this information – to really make it yours? In what ways has this ego defense actually served you? What need does this automatic behavior fulfill? In what ways does it need to be honored? How can the energy of the previously unwanted emotions be discharged consciously and safely? It is important that we understand that these things we are hearing from Rescuer and Persecutor are merely relics from another time, or at most, an oversimplified assessment of reality. They developed to protect us from becoming overwhelmed with feelings of vulnerability, sadness, neediness, or fear at a time when we were not yet developed enough to handle these emotions without the support and attention of a safe other. This is the end of Module 2, and what is intended to be the second week of the course. Take a few days to absorb this material. Print and review your handouts, begin to monitor your inner environment (details in handout below), and join the private Facebook Group if you have questions or would like to know what other students are sharing.